Roger Federer is in the middle of nearly two months off from the tour, resting and training for the upcoming stretch, beginning in Madrid next month. The Swiss maestro confirmed yesterday that he will play at the Swiss Indoors in Basel this year, amidst much confusion and misinterpretation. In an exclusive interview with Rene Stauffer (@staffsky) for Tages Anzeiger, the Swiss star spoke about his recent back issues, brief holiday in Switzerland, and his thoughts moving forward in 2013. Update: Rafael Nadal is also scheduled to play at this year’s Swiss Indoors, confirmed today by the tournament’s organizers. The Spaniard will return to Basel for the first time since 2004 (Tennis.com. Read FedererFan07.com’s exclusive interview with Paul Annacone here. Roger Federer ended the speculation and said that he will contest the 2013 Swiss Indoors. Under new conditions. You are surrounded by a nearly two-month break from competitions. What do you do during this time? First, I was recovering from the tournaments in Rotterdam, Dubai and Indian Wells. I had to work a short vacation, but after nine days, I started again. I did not do anything just three weeks. 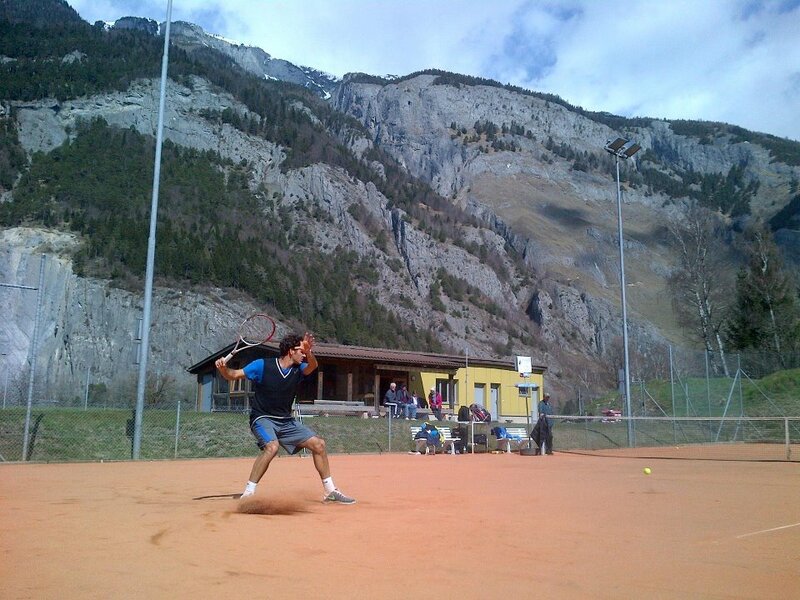 I have now been a long time back in Switzerland in fitness training, tennis and I’ve played again. Despite the bad weather? Bring this to your building is not in default, then just before the sand season? Because I previously worked on a lot of fitness, the weather was not a big problem for me. So far I just played in a balloon house on sand, I dodged twice on hard courts. That is why I am pleased that it is getting warmer on the weekend, then I can start to train hard outside. Over the next few weeks, the training is more intense. It would be important that I find the last two weeks before the tournament in Madrid (from May 5) good training conditions. Then it would be nice, especially that the weather holds. How’s your back that you handicapierte strongly in Indian Wells, especially in the quarter-final against Rafael Nadal? I am satisfied, can again do everything. But it was longer than I had thought. I am glad that I am now back in training and can also play tennis. Indian Wells blow everything went on strike. I could not get enough rest after the match against Wawrinka, and against a player like Nadal to win I can not be in such a state, I do not know to what percentage I was fit. I wanted to try it. The break came at the right moment. Stay in Switzerland until the start of the season and let sand fly as a sparring partner in recent years? They were long gone so many weeks in a row in Switzerland. Enjoy this? Absolutely. I had missed the Switzerland in recent years. It is also nice, with the little time to play in the environment, to be here with friends and family come to terms with things. I could come down a bit from everyday life on the tour, return to its normalcy. 2012 was particularly stressful because of the Olympics. I’ve enjoyed the last few weeks, even if the weather was bad. On Wednesday of next Davis Cup opponents Switzerland is known. Depends on him if you are in September to be there? We must take it as it comes. Whether I’ll be there, I do not know. That can wait. Another open question is whether the fall in Basel play after your contract has expired. For me it was always clear: I will also play the Swiss Indoors 2013th I’ve not only communicates, but now the time has come. I played in Basel over the years, whenever I was not hurt. Everyone knows how much this means to me tournament, and that is still true. I’ve been there a ball boy, was playing in the qualifiers, even as a junior hit on Andre Agassi. I have experienced many memorable moments in this unique atmosphere with the great fans, and I am pleased extremely to be able to experience this year. So it has now been an agreement between the Swiss Indoors and you? No, but that was not even necessary. I can play in Basel also no contracts or arrangements, if I feel like it, and I did. To compete on home soil is very special for me because I’m on the road all year. I do not want to miss this chance. There was much discussion about the negotiations between you and Show Director Roger Brennwald, rumors and speculation, it was also a lot of money talk. And now you just play? For this I really want to say anything further, because otherwise it just might be misinterpreted again. I never said that I will not play in Basel. And now I am trying to simplify this complicated matter. Does that mean that you will miss this Paris-Bercy again? I’ve often missed because of the Swiss Indoors tournament, that’s nothing new. Although I do also like to Asia or Paris, but you can set priorities, and Basel has always been one of my priorities. In the annual ranking you are unaccustomed to 8th Point. Have you wondered why early to play tournaments again? I’ve actually considered briefly. But I’ve always told that this year the training and recovery should be at the center, and this way I will go farther. What I save on energy today, I can invest later. At the time when you do not play, you fill the reserve tank, which I’ve noticed over the years. I also find that I have not been playing that bad. In Australia, I was good, Rotterdam (Off against Benneteau) was disappointing in Dubai I would never lose in the semifinals allowed (against Berdych), and who knows what would have happened then. One should not over-analyze this phase. And now I am preparing to make it better in the coming months.